Disasters come in all shapes and sizes. Hurricanes, tornadoes, and floods certainly reek havoc on individuals, but house fires, vehicle accidents, and community violence can be equally devastating to families. Disasters are always about loss. Calamities can rob people of homes, material possessions, income, personal keepsakes, normalcy, emotional stability, and loved ones. The loss is real. It can be emotionally, physically, and spiritually overwhelming. These catastrophic events often force people to live with intrusion, vulnerability, and a longing for escape. The trauma of a disaster throws people off balance and always produces significant change. Survivors often experience shock, numbness, fear, frustration, confusion, guilt, grief, and anger. They are often left to depend on strangers for the basic necessities required to get through another day. Disaster Relief ministry reminds those affected that we care and even deeper…God cares. Disasters create doors of opportunity for us, as followers of Christ, to offer compassion to those affected by loss and pain. The Bible teaches us that this is just the right thing to do when our neighbor is hurting. Jesus said, “For I was hungry and you gave Me something to eat, I was thirsty and you gave Me something to drink, I was a stranger and you invited Me in, I needed clothes and you clothed Me, I was sick and you looked after Me, I was in prison and you came to visit Me…inasmuch as you did it to the least of these my brethren, you did it to Me.” (Matthew 25: 35-40). When we reach with compassion to the vulnerable and displaced, we are honoring Jesus and sharing His love. Disasters also open tremendous doors for the Gospel. Survivors gladly welcome those responding to help them. This creates opportunities to share the hope that is within us. In crisis events, compassionate acts of service and empathetic listening often open gates to share the Gospel. Tragically, most churches are unprepared with a strategy to respond effectively to events of crisis within their community. 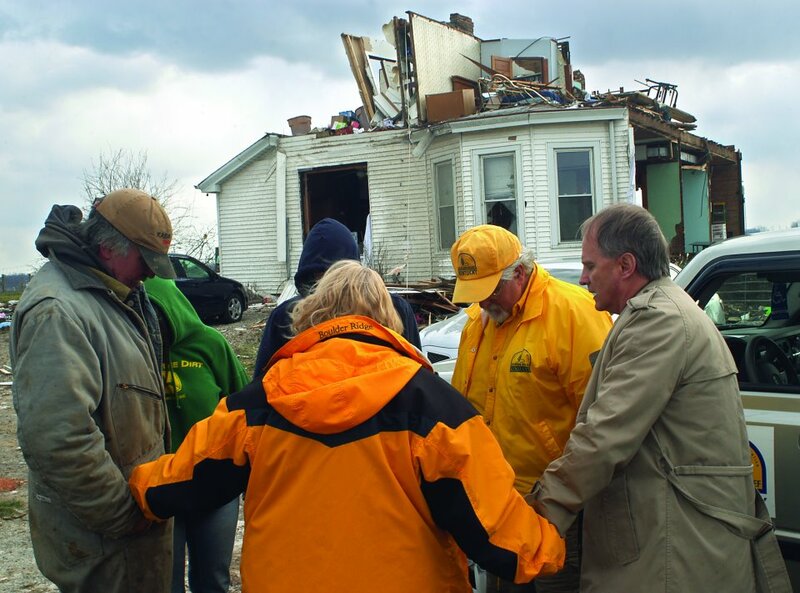 Kentucky Baptist Disaster Relief seeks to train volunteers and partner with churches to bring help, healing, and hope to those affected in times of disaster. Is God calling you to get involved and to be more prepared to serve effectively for His sake among the hurting?